I’m a big movie fan, though I don’t often actually get out to the theater. Netflix has provided a welcome alternative to plunking down $10 or $15 for a ticket and then another $20 or more for snacks. Though I do admit I kind of miss that big selection of candies, over priced as it may be, at the concession stand. The mixologists at VaporFi must be fans of movies too, or at least movie theater candy. They’ve crafted an amazing ejuice based on a cinema treat, Bites Vanilla Caramel Swirl. Bites Vanilla Caramel Swirl starts with a mild vanilla note that quickly welcomes a sweet, slightly dark caramel that pushes the vanilla to the back of the mix, but not completely out of it. That’s the thing about vanilla, it’s an amazingly accommodating flavor that welcomes and enhances most any flavor that’s lucky enough to be paired with it. On the exhale this ejuice finishes with that caramel and the hint of a rich Bavarian cream. The vapor of Bites Vanilla Caramel Swirl is rich, smooth and cool with a mild throat hit. The aroma is mild and dominated slightly by the caramel. I had pretty high hopes when I first heard about and then received VaporFi’s Bites Vanilla Caramel Swirl. I was not disappointed. This is one of the most enjoyable vape experiences I’ve had in quite some time. It’s sweet, but not overbearingly so, and amazingly creamy and rich. Fans of vanilla and/or caramel vapes are going to be big fans of VaporFi Bites Vanilla Caramel Swirl. VaporFi offers Bites Vanilla Caramel Swirl in 30 ml and 60 ml bottles for $17.99 and $32.99. Available nicotine levels are 0 MG, 3 MG, 6 MG and 12 MG. VaporFi mixes Bites Vanilla Caramel Swirl in a Max VG blend. I vaped Bites Vanilla Caramel Swirl in a SMOK TFV8 on a VaporFi VEX 150 TC mod. VaporFi provided the bottle of Bites Vanilla Caramel Swirl that I sampled for the purpose of this review. 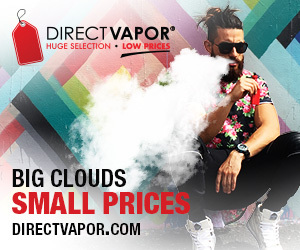 VaporFi is a Seven Report advertiser. 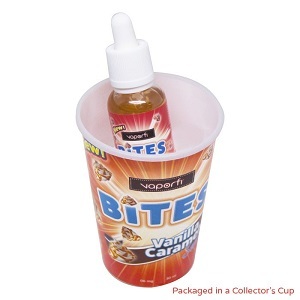 Order Bites Vanilla Caramel Swirl from VaporFi.